ukushima Dolphin are an unusual band. To watch them perform you’d think they were a veteran musical outfit, but their current line-up have only been playing together for a few weeks. Comprised of Alex on drums and Josh Butler on guitar and lead vocals, the duo make heavy use of delay and loop pedals to fill in the spaces in their sound, a hybrid of 80s psych-rock and 90s dance grooves. There’s a good chance you’ve seen them out busking around town, where they’re likely to be entertaining a sizeable crowd of onlookers. 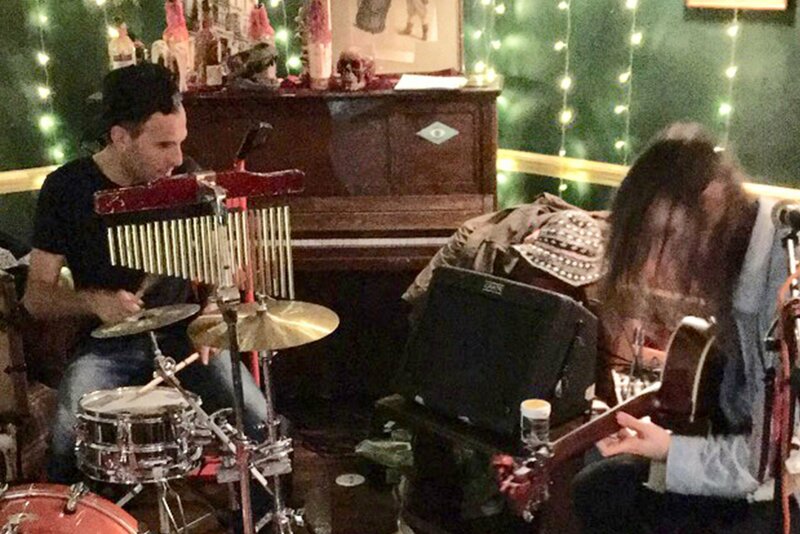 Their set list at the Idle Hands pub on Friday night was an eclectic mix of original songs and classics from across the decades, reworked and crafted into shimmering passages that gradually built into textured walls of sound, propelled by tight 4/4 beats. Personal standouts included covers of MGMT’s Kids and All Apologies by Nirvana, sounding here more like a hypnotic Radiohead number. The crowd were receptive, and the pub filled up over the course of the set, with people wandering in from the streets to investigate. Anyone interested in seeing the Dolphins should head back to the Idle Hands, where they’re set to play again on Sat 6 April 6 2019.